Our healthy Latin influenced dish packs layers of flavor; a luscious sauce sweetened with ripe mangoes and plantain is the perfect complement to savory chicken cutlets and colorful vegetables. Cut two mangoes into cubes. Mix the mango, habanero, sugar and chicken broth; set aside. Use other mango to make 4 pieces cut into fans to decorate plate. Prep the chicken breasts by slicing horizontally through the center to make two pieces. Pound out each piece about ½ inch thick between pieces of plastic wrap. Season each piece well with salt and pepper. Dredge the chicken with flour seasoned with smoked paprika. Set aside. Make the sauce: In a sauté pan melt the butter over medium heat. Add the red onion, thyme and salt, sauté until the onion softens. Add the wine and simmer until reduced by half. Pour the mango mixture into the pan, simmer for 10 minutes, squeeze ½ fresh lime into the pan, stir the sauce, check for seasoning, keep warm while proceeding with recipe. Cook chicken and vegetables: In another large sauté pan, heat oil over med-high heat. Add garlic and floured chicken cutlets, fry chicken until lightly browned on both sides. Remove chicken and garlic from pan; keep warm in a 300 degree oven. Wipe out pan, add a knob of butter and a little oil and heat until bubbly, add the plantain, the cherry tomatoes and asparagus spears, sauté until the plantain is browned and the tomatoes and asparagus are wilted. To Plate: Ladle sauce onto the center of each plate. Place asparagus on sauce with the tips facing out, three on each side. 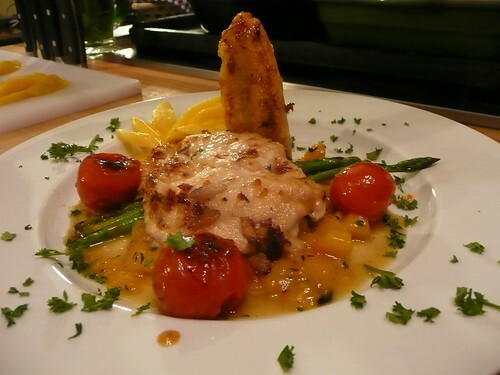 Place chicken on top; add cherry tomatoes on one side of plate with the plantain angled over the chicken. Fan a piece of mango decoratively on plate. Sprinkle with cilantro or parsley. *Ripened plantains will be sweet when they blacken and their starch has turned to sugar. This entry was posted in Recipes, Entrees (Platos Fuerte), Meats and Poultry (Carne) and tagged Mexican recipe, chicken recipe, cook with us, hispanic food network, mango, mexican cooking, mexican food, pollo. Bookmark the permalink.